New Orleans' Frenchmen Street boasts no shortage of incredible music venues, including The Spotted Cat, Apple Barrel, Snug Harbor and many more. 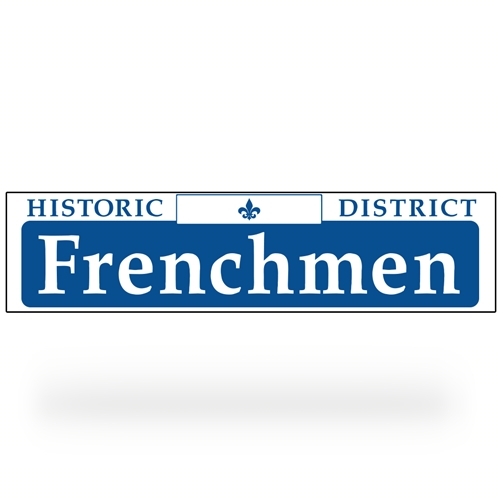 Some of the best music in a town filled with music can be found on Frenchmen. Bluescentric Brand Frenchmen Street sign measures 24 inches by 6 inches (610x152.5mm) and is quality aluminum, not the other guys' cheap plastic knockoff. Signs great for indoor or outdoor use, will last up to 6 years outdoors. The vintage New Orleans street sign does not come with drilled holes or mounting brackets.